Busan is a city in the southeastern province of South Gyeongsang, in South Korea. It's the second largest city in the country and is the largest seaport. Many people visit the area because of the nice beaches, hot springs and nearby nature reserves. They also host a variety of events including the world famous international film festival. 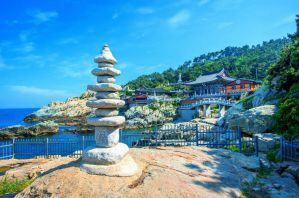 If you want to visit a South Korean city that has a more laid back vibe than Seoul, then this is a good option. It has an international feel and continues to attract more and more international tourists. There are a wide variety of guesthouses, hostels, and hotels in Busan. Many people enjoy staying near Haeundae beach, Gwangalli beach, Jagalachi, and near the bus and train stations. Prices often go up on weekends or during popular events. The Wendy House is a conveniently located hostel by Gwangalli Beach. It's a great area for night life and entertainment. It's also a comfortable place to stay that is reasonably priced and offers a good value. There are a variety of amenities available to guests including security lockers, power outlets by every bed, air conditioning, heating, and free wi-fi throughout the property. The hostel has a pleasant rooftop terrace where you can relax with a good book or enjoy the views of Diamond Bridge. The hostel also serves a filling breakfast every morning that is included in the price of your room. This hostel has dorms that sleep four or six people. There are co-ed, female only, and male only rooms available. It's a social setting and it's not hard to meet travelers from around the world. Whether you're traveling alone or as part of a small group, you'll quickly feel right at home here. Another favorite place to stay for international travelers, Guesthouse COOOOL is a boutique style guesthouse that is conveniently located in central Haeundae. It's a short walk to the beach and about a five minute walk to the subway. The surrounding area has a variety of different restaurants and bars where you can try Korean barbecue, seafood, or curry. Nearby you'll also find the Busan Aquarium, Shinsegae Duty-Free and Paradise Casino. The guesthouse has an impressively designed interior that is very professional and modern. It's a great place to relax with other guests and enjoy the modern amenities. Breakfast is served every morning and this is a great time to get to know other guests. There's also a shared refrigerator and microwave available to guests. Dorms are available that sleep four, eight, or eighteen people. Rooms are split by gender. The New Day is conveniently located near all types of transportation. It's close to the Haeundae Subway, the Railroad Station and the bus terminal. This convenient location means you have access to most of the surrounding areas. The hostel itself has a nice outdoor terrace where guests can relax. There are a range of amenities available to guests including a free breakfast that includes bread, eggs, jam, coffee, and tea. There is a shared kitchen for guests as well as a mini bar where you can purchase snacks. Wi-fi and public computers are also available. Guest can choose from either private rooms or dorms. Private rooms include twins and four bed family rooms. Dorms sleep six or ten people and are split by gender. If you're looking for a comfortable place to stay with a friendly atmosphere and helpful staff, then The New Day is a good option. Blue Backpackers is another nice hostel in Busan. It's a friendly place to stay that appeals to travelers from around the world. It has a social setting with a good common room where guests can hang out. There's a television and computer in the common area as well. Guests can also share the public kitchen which is convenient for preparing your own meals. The hostel has all of the standard amenities including free wi-fi, free breakfast, and a washing machine. The hostel is located in central Busan. It's about a five minute walk to downtown Seomyeon, where you'll find lots of restaurants and shops. It's also about a ten minute walk from the Seomyeon Subway Station, which provides access to many parts of the city. Private rooms are either singles, twins, or four bed family rooms. Dorms sleep up to six people. All rooms have a private bathroom.